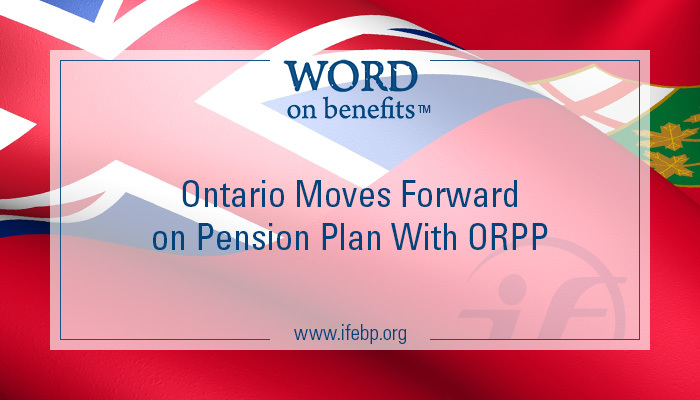 Enhancing the Canada Pension Plan (CPP) is expected to be an issue in October’s federal election, but in the meantime Ontario is moving forward with an effort to create its own Ontario Retirement Pension Plan (ORPP). The Ontario Ministry of Finance released a consultation paper, Ontario Retirement Pension Plan: Key Design Questions, late last year. Bill 56, called the Ontario Retirement Pension Plan Act, was tabled for the first reading in December. The government has held meetings seeking input on the paper and accepted comments online through February 13. Bill 56 reached second reading and debate February 17 in the Legislative Assembly of Ontario. Stay tuned for future developments, but here are the basics on ORPP. “The ORPP is intended to provide a predictable source of retirement income for those most at risk of under-saving, particularly middle-income earners without workplace pensions,” the consultation paper states. The Ontario government is concerned that many workers are not saving and will have a lower living standard in retirement. Only 34% of workers in Ontario are covered by a workplace pension plan, and about 50% of Ontarians did not contribute to either a workplace pension plan or a registered retirement savings plan in 2012. The ORPP proposal has raised concerns among many plan sponsors of defined contribution (DC) plans because the government is proposing that they may not be considered comparable workplace pension plans. Many DC plan sponsors say they already provide adequate contributions. If those plans are not considered comparable, some question whether employers will continue them and/or lower their contributions in order to fund both ORPP and a DC plan. A survey of Human Resources Professionals Association (HRPA) members showed that 55% oppose ORPP and 58% believe the Ontario government should continue negotiating with the federal government for CPP enhancement. According to HRPA, 75% of its members’ organizations offer a workplace savings plan—more than half of which are DC plans. A Canadian Life and Health Insurance Association survey of Ontario companies that offer a DC or group registered retirement savings plan found that 78% would be very or somewhat likely to reduce contributions under their existing workplace plan if ORPP is introduced. In addition, 66% said they would or may consider eliminating their existing plans. Keep an eye on our Canadian Pension Reform—Ontario page for ORPP developments.